There's nothing wrong with the great outdoors that you can't cure by staying indoors. Cor, what a draught. But sometimes circumstances force you out and keep you there. 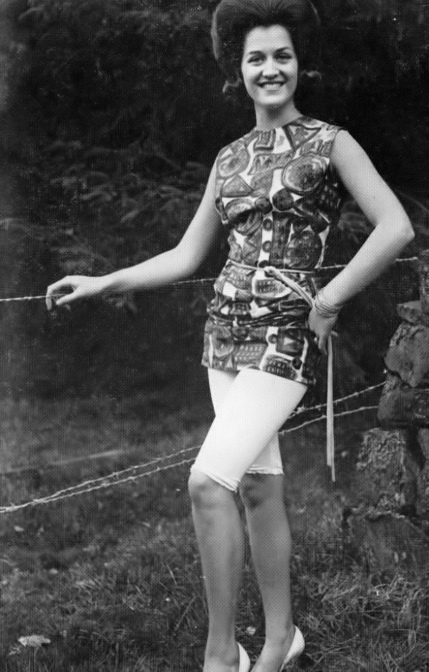 Like when TV personality ANNE SCOTT took an outdoor modelling assignment and couldn't ethically back out. And when she found she was modelling lingerie in a temperature that called for a fur coat, she knew what outdoor hazards really were. Talk about how to look glamorous with shivers rocketing up and down your spine. What a petrifying carry-on. "I think I'd rather be a non-combatant mercenary,” said Anne. "What's a non-combatant mercenary?” asked Fred. "But bring your own soup," said Anne. Some girls would either sit around polishing their nails or even disappear behind the door when the family car required cleaning. Other girls are good girls and don't mind helping at all. as long as dad doesn't ask them just as they're getting dressed for a garden party. ANNE SCOTT is happy to keep the car looking pristine, then she can always put in a request to borrow it without shuffling her feet around. Polishing can be warm work, and if that means discarding an item or two it all goes to show what a lovely girl she is as well as a good one. It seems from what the fashion pundits say that the era of exquisite feminine lingerie has gone with all the other dated items of yesterday. It's just going to be stretch tights forever from now on, so they say. Even bras are going out. The fashion pundits are always far more interested in selling themselves than in making us happy. We're not like that. We want to make you happy this month by bringing to your dreamy eyes the look that graced the fashions of yesterday, and ANNE SCOTT in the lingerie that used to make all the advertisements on the underground look so alluring is quite irresistible, don't you think? If you prefer stretch tights and a body stocking, you're so modern that there's nothing we can do for you. Anne is a deliciously photogenic Scot from Glasgow. Are you happy too now?